Scott Parker's West Ham future could be close to a resolution as Chelsea ponder whether to firm up their interest in a season-long loan deal and Aston Villa emerge as rivals for his signature. West Ham accept the 30-year-old midfielder, who has four years left on his current deal, will leave after their relegation and want around £8m. BBC Sport understands West Ham have yet to receive an approach from Chelsea. But they are aware of the possibility of a deal and would be receptive. Chelsea's interest in Parker, who first joined the Blues in 2004 for £10m, has increased after Michael Essien was ruled out for six months with a knee injury and is independent from their interest in Tottenham's Luka Modric. Villa are believed to be willing to pursue a deal close to West Ham's valuation - but a loan deal is appealing because Chelsea would pay a fee to secure the England international for a season and leave open the possibility that he could move back to Upton Park if they return to the Premier League at the end of next season under new manager Sam Allardyce. The £20m sale of Stewart Downing to Liverpool has given new Villa boss Alex McLeish money to spend in the transfer market, with Manchester City goalkeeper Shay Given and Wigan Athletic's Charles N'Zogbia in his sights. 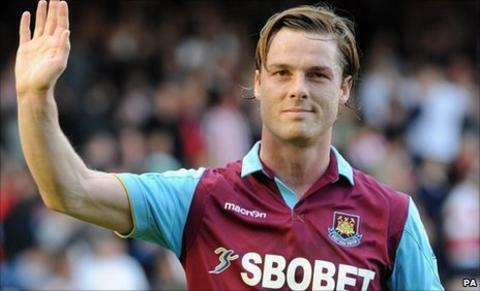 West Ham co-owner David Sullivan said: "A loan deal would appeal to us because we love Scott. We would obviously want a loan fee because he has substantial value to us." Fellow co-owner David Gold recently told BBC Sport that West Ham would love to keep Parker at Upton Park - but accepted his England ambitions meant this hope would be thwarted. "I am a West Ham supporter but I am also a realist," said Gold. "He is an England international who has done ever so well for his country recently, and not many of those play their football in the Championship."